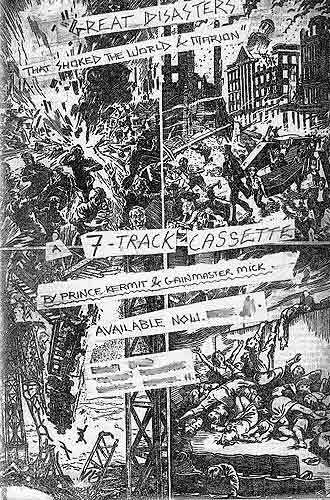 Recorded on a Revox A77 by Mick Sinclair (as Gain-master Mick) and Prince Kermit (as himself), the 7-track independent cassette release on the Cool-Cat-Daddy-O label called Great Disasters That Shook the World & Marion was based on the text of a book published circa 1920s by the Dundee-based publishers D.C. Thomson, better known of course for The Beano. The book described various disasters that had indeed shaken the world, be they the Black Death of the Middle Ages, the Japanese earthquake of 1923, the first Zeppelin air raid on Britain or an ill-fated attempt to climb Mount Everest. 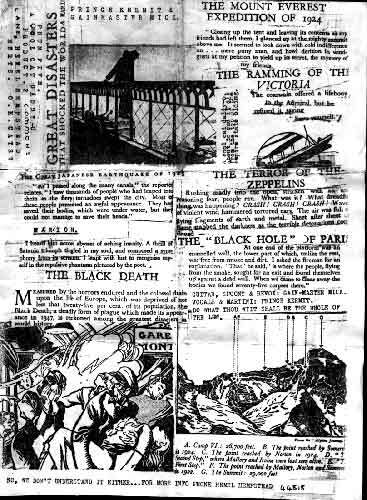 The tales of death and destruction were conveyed not only with sensationalist prose but with the imperialist tone common to mass market British books of the time. Prince Kermit recited selections from the text and Gain-master Mick added accompaniment on a variety of musical implements, from guitar played in various unorthodox styles to partially-filled saucepans being tapped with forks to re-create the sound of ice picks (as on ‘The Mount Everest Expedition of 1924’). The song ‘Marion’ was based on something quite different but seemed strangely to fit. Plans were made for a sequel and recording began with a Teac 3340 increasing the recording/mixing options. Subsequently recorded were ‘The Death of a Thousand Slices’, which was released on a third party compilation cassette that few people can remember the name of, and the as yet unreleased ‘The Beggar’s Song’. While the latter track in particular features greatly enhanced sound quality, the subject matter, based as it was on the 1920s texts, continued to be a mix of gore and jingoism that was easily misinterpreted. Consequently, the projected CD, provisionally titled Crawling Out of a Nightmare, that collected bit the original 7 tracks plus the two mentioned above, remains on the shelf for the foreseeable future.